Love flows like a river across the face of the planet and touches each inhabitant. The winds of change are bringing constant revelation to the surface of their consciousness. Each individual is in the process of discovery about their origin, their true capabilities, and their divinity. Their soul seeks to know and touch that sublime Presence within them. There is much that is in completion in these moments of time, spiritual contracts are ended and new ones begin. There is a natural connection taking place with souls of like mind that draws each one to the next phase of their soul plan. They gather together to unite their energies in higher purpose. There is a higher love at work now, one that manifests a sense of oneness with their new liaisons. 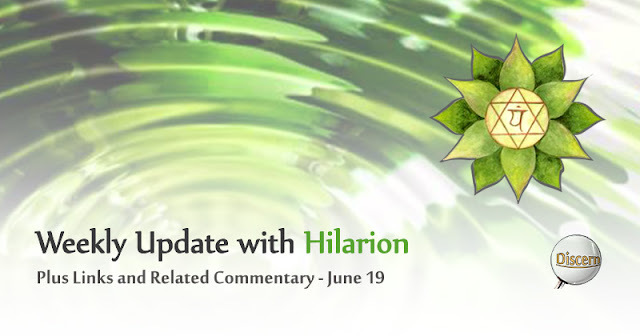 It is normal for me to find a good majority of synchronicity in the updates from Hilarion. It is as though the one channeling (or Hilarion himself) is reading from my life story, whether at present, or at some point in the near past. These synchronizations either come in the form of verbal confirmation or extreme congruency with my present sentiment at the time I read the update. I don't necessarily depend upon any channeling for guidance, but I very much appreciate how accurate those from Hilarion typically feel. Here is yet more congruency with that which I am presently experiencing. I have had numerous endings, along with many new beginnings and introductions. I have even received help and direction from soul guides (after learning how to distinguish the positive from any masquerader), and have been helped in letting go of past experiences. It seems that at every point, the world feels new. I am not sure who would be leaving the planet. I do know that death happens every day. To be honest, it is not exactly a joyous concept for me to consider. Though I do appreciate the sharing of one thing which I have heard of in the past. That is that the soul (given that one is able to let go of our pasts and appreciate them) experiences extreme joy and gratitude for the experience of life. At different points in my past, I imagined leaving the planet to be a great joy, not because I was grateful for my experience, but because life seemed so terrible that I could imagine little worse at the time. However, presently, after searching for where my soul truly belongs, I have learned that the next density is where I belong. Along with this urge to ascend is a desire to aid others in their own process of graduation. Whether that means simply being an energetic encouragement, or helping directly, I would like to be a help in this way. There is only a question of how to apply this urge to assist. I think it is important to realize that before leaving this planetary sphere, we must realize that the experience is not at its true potential. Though I understand that we all come to this planet for different purposes and experiences, these experiences have much more to offer than that which we may have had. As I understand it, there are countless experiences of incarnation for a soul to have. There are also numerous planets and densities through which a soul can have these experiences. The choices are nearly endless, and no matter how difficult one incarnation may be, I believe it is always a good thing to be grateful for each opportunity of incarnation. After all, as infinite, divine consciousness, the comparatively instantaneous experience of pain and discomfort is virtually nothing. As we may realize afterward, the unpleasantries can be a blessing as well.